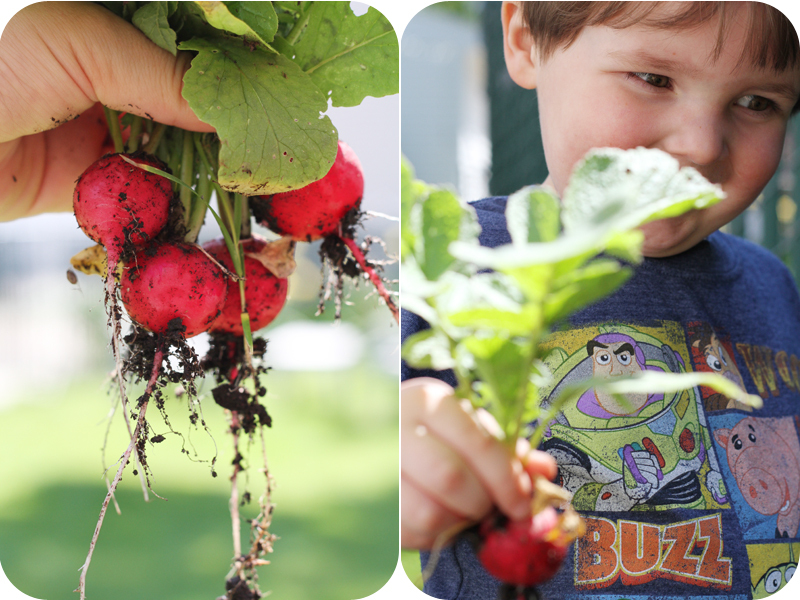 Me and Finn picked our first crop of radishes from the garden this week! Totally thrilling (not even being sarcastic)! I’m loving every second of this little garden. We check it almost daily to see what it’s up to, and our patient waiting has finally paid off. Both Finn and Elsa gave radishes a whirl but neither were into the spice factor. Soon enough they’ll be loving those red things, I’m sure of it. The garden has been going well overall! I’ve been following along according to the seed planting schedule in the square foot gardening book and have been successful in most arenas. I’m having a problem with a few of my seedlings though. We started some seeds indoors back in March, they grew and grew. We took them outside to acclimate them to the new temperatures before planting, and then we planted those suckers. Unfortunately, our tomatoes and peppers are stunted at the stage we transplanted them. They are still alive and green but just not growing. The only think I can think of is that I planted them with the pot that was advertised as being able to “plant right into the ground.” So, do I wait it out and hope they come around, or do I run to the nursery for more mature plants? I’m a little bummed about this scene. I’ve also had trouble with a few of my seedlings, we’ve had quite the rainy spring, and by rain I mean pounding sheets of rain. My little leaf lettuce is having a hard time growing when it’s getting pummeled back into the ground by ginormous rain drops. Total rain dis! Anyways, I’m excited to see how it goes (or grows when I’m being real punny). Looking great- and delicious!!! Radish sprouts are nice and spicy- have you tried growing sprouts before? Always wondered: how do you know when things growing underground are ready to pick (radishes, carrots, etc.) ??? Give the tomatoes time! 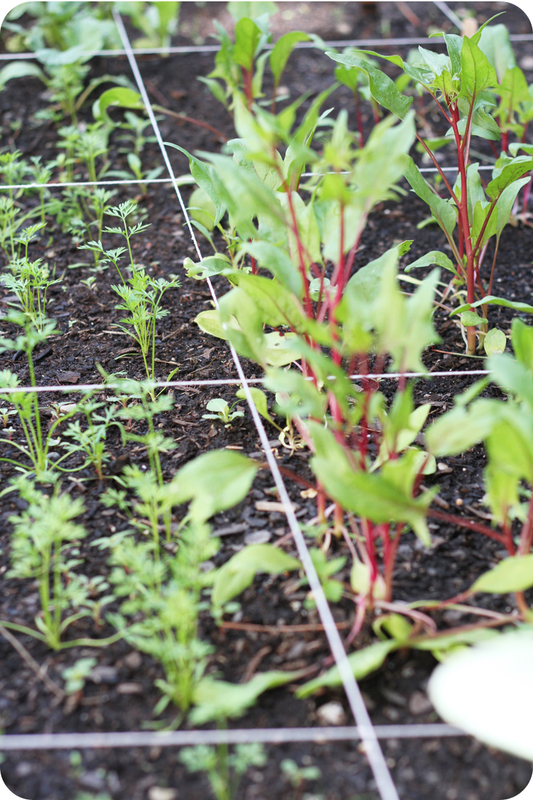 They don’t burst into action like the radishes or spring greens, but once they get going, they will grow like crazy. Thanks for the encouragement. I’ll keep the dream alive! Hope your garden/farm is doing well! Good advice on the farmers market. I might have to run over to the Kingfield market this Sunday and see what they’ve got going on. Are you gonna blog your garden?? I wanna see it! Older Post Another Post about Door Knobs!